SMH-ASSIST » NCDSB Kicks off the School Year Talking about Promoting Mental Health! NCDSB Kicks off the School Year Talking about Promoting Mental Health! At Northeastern Catholic District School Board (NCDSB), staff started off the school year talking about the foundational elements for creating mentally healthy school environments. With the support of NCDSB senior administration, it was determined that promoting positive mental health was a fantastic way to kick off the year. NCDSB focused on the mental health strategy early in the new school year to help staff develop the skills and understanding they need to support our students, she added. 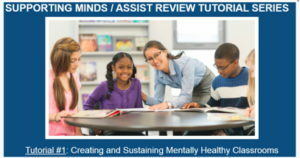 Thanks to the online resources available through School Mental Health Assist, NCDSB school communities accessed the online learning module Creating Mentally Healthy Classrooms during the September 1 professional activity day. School teams across our district – principals, vice-principals, educators and support staff – shared in the learning session. They could discuss practical ways to support student mental health and well-being, as well as the role of the school in the overall system of care. Promoting a growth mindset and mindfulness practices, to name a few. The learning and conversations we engaged in need to be more than a “one off.” NCDSB intends to build on these themes through a communication plan that includes regular staff updates and opportunities in the coming months. Stay tuned! The percentage of students who rated their mental health as fair/poor in 2013 (15%) is significantly higher than in 2007 (11%).